Let’s start the new year together with more rewards for your loyalty points. You can now redeem your rewards with as few as 100 points or as many as 1,000 points. The more points you earn, the more you save. Earn 100 points, receive $5 off. Earn 200 points, receive $10 off. Earn 300 points, receive $15 off. Earn 400 points, receive $20 off. Earn 500 points, receive $25 off. Earn 600 points, receive $35 off. Earn 700 points, receive $45 off. Earn 800 points, receive $55 off. 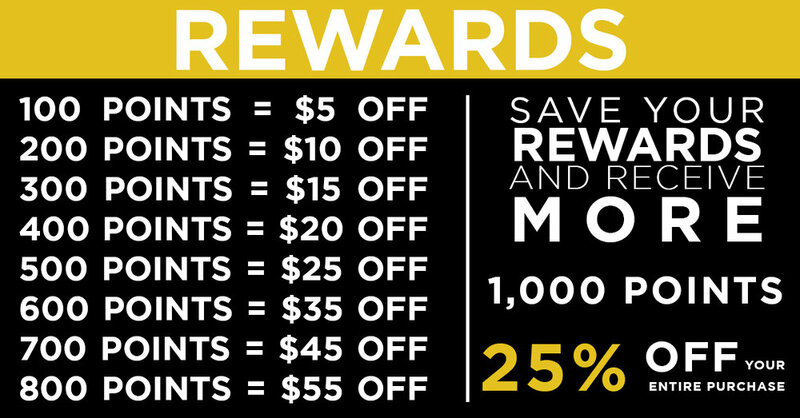 And if you can save up 1,000 points, you'll receive 25% off your entire purchase.